The Jet 1 high production addressing and imaging system has been designed for the mailing professional. The Secap Jet 1 system can be configured with 3", 4.5" or 6" of print. The system provides users the ultimate solution for improving productivity by offering true synchronization between the feeder, base and conveyor reducing the need for operator intervention. Combine the heavy-duty vacuum transport base with the high capacity feeder to process large volumes of media eliminating the need for additional operators. 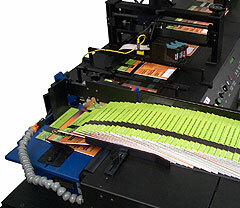 The high capacity feeder can easily handle 2000 #10 envelopes at one time. The Jet 1 vacuum base is extremely flexible and can be utilized in-line with a tabber, inserter and other equipment that requires a transport. With its fully integrated speed control, the speed of the entire system can be adjusted with the turn of a single master dial. The Jet 1 handles a wide variety of media such as periodicals shown above. Other media includes flat, poly-wraps, newsprint, self-mailers, envelopes and other materials. Thickness: From .002" thick to .625"